In the last 12 months, income from fares has risen by 7.4% for British passenger rail operators. The figures relate to the first half of the 2015/16 financial year and the last two quarters of 2014/15. The revenue comparison was £9.13 billion compared to £8.50 billion, a rise of £630 million. The fare yield improved as passenger numbers rose by 4.1% when using the same period of comparison with users making 1,680 million journeys compared to 1,614 million. The strongest growth continues to be in London and the South East where trips were up by 4.6% to reach 1,176 million a figure that accounts for 70.1% of passengers using the network. Longer distance journeys categorized as InterCity by the Office of Rail and Road who tabulate the statistics, account for only 8.1% of journeys but 34.4% of fare box income. Revenue growth for the franchised services was the strongest at 7.7%. Revenue secured by the small open access sector grew in total by 17.2% to reach £68 million given the gradual increase in operations and popularity of the services that is recorded in official National Passenger Surveys. Regional services which include operations in Scotland and Wales saw the lowest level of passenger growth with 2.6% additional journeys to reach 366 million and a 6.7% revenue increase which totaled £1.38 billion. The continuing level of growth is changing the dynamics of rail industry financial assumptions in the current 5-year control period. 14% passenger growth was forecast between 2014 and 2019 but on current trends is likely to exceed 20%. Greater volume will impact on outputs such as the CP5 requirement to achieve a PPM of 92.5% apart from East Coast, West Coast, and Great Western where there is a target of 88% with an additional CaSL limit (Cancellations and Significant Lateness) of 4.2% for East Coast and 2.9% for West Coast. 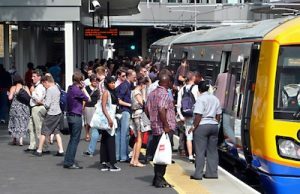 Research undertaken by Network Rail and South West Trains has shown that as passenger numbers increase station dwell time lengthens. This has not been helped by the programme to lengthen platforms and reluctance by users to use the space evenly. More attention to station design is recommended with improvement to the length of canopies, waiting rooms and location of other facilities. There is also an impact from additional activity on Network Rail costs for operations, maintenance, and renewals. At the time of the ORR CP5 determination it believed that NR could produce efficiency improvements of 19.4% reducing NR’s own assessment of its day-to-day expenditure needs from £23.29 billion to £21.36 billion during the 5-year period. It is clear from the recent review by Sir Peter Hendy that this is not achievable but the funds flowing into the industry as a result of increasing use by its customers will square the circle in allowing more money to be provided to sustain network performance. FCP has been associated with many investment projects to respond to higher demand and our skills base can be trusted to meet the delivery requirements of an expanding industry.